Editor's note: Noma closed at the end of February 2017 and in due course is planned to relocate. 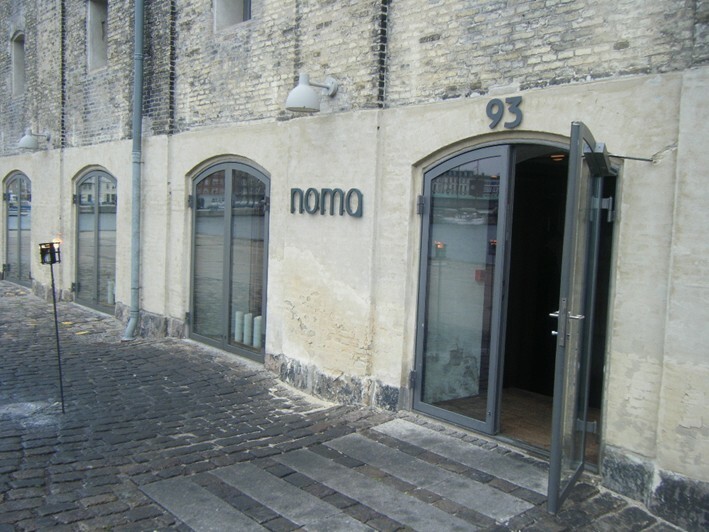 Noma is situated in a very old storage building used to keep salt, and its old beams and bare brickwork show signs of the effects of the salt over the centuries. They have chosen not to disguise this, but keep the somewhat stark, industrial feel to the dining room, which has an open kitchen, and a lounge area beyond this. The informality extends to the lack of tablecloths: this is all about the food, not the surroundings. The cooking style is distinctive, not in any sense traditionally Danish, but with a heavy emphasis on local Danish ingredients, many of which have been largely overlooked. I usually score each dish, but there is so much that is unfamiliar to me here that I will just rely on comments, since I simply have no memories with which to calibrate, say, musk ox. 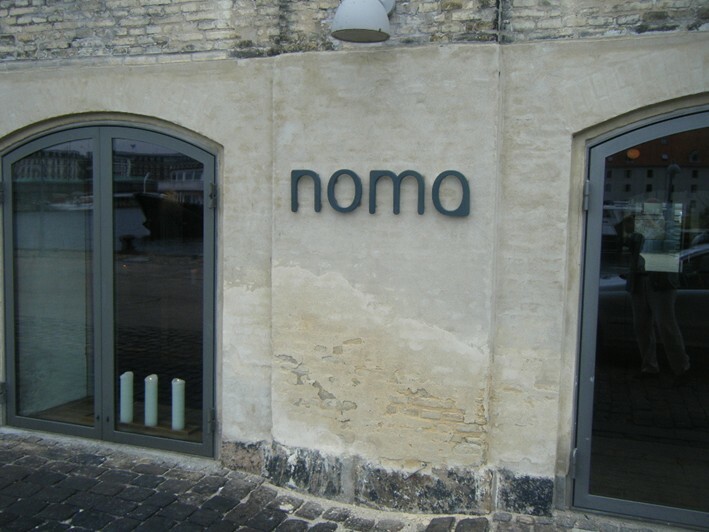 The name “Noma”, incidentally, is just a name; contrary to some reports it does not (according to the restaurant manager) have any embedded meaning. The wine list is very extensive, having a particularly lengthy and fine selection of German wines. Egon Muller Scharzhofberger Kabinett 2004 was listed at DK 995 (£117) compared to a UK shop price of around £32. Back in French territory, Leflaive Batard Montrachet 2003 was listed at DK 3250 (£384) compared to a UK retail price of around £112. 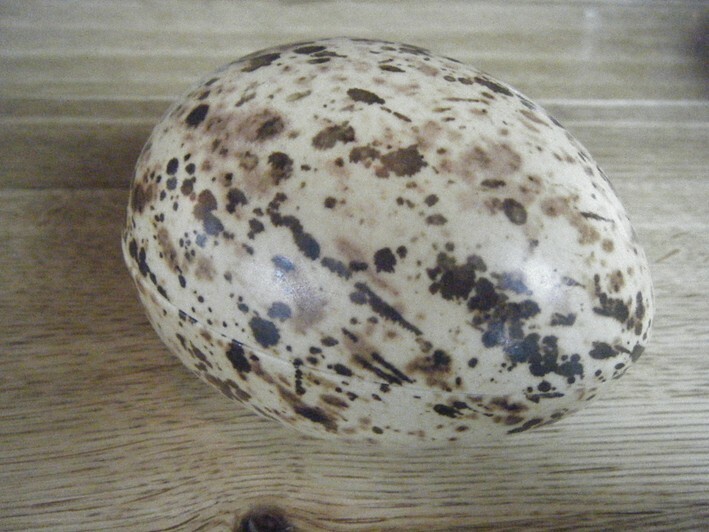 At the upper end, Pingus 1996 was listed at a scary DK 14,000 (£1,653) for a wine that you can buy in the UK for around £395. The mark-up level seems not to be entirely consistent e.g. Krug 1996 was DK 4425 (£522) for a wine that costs around £300 in a UK shop. 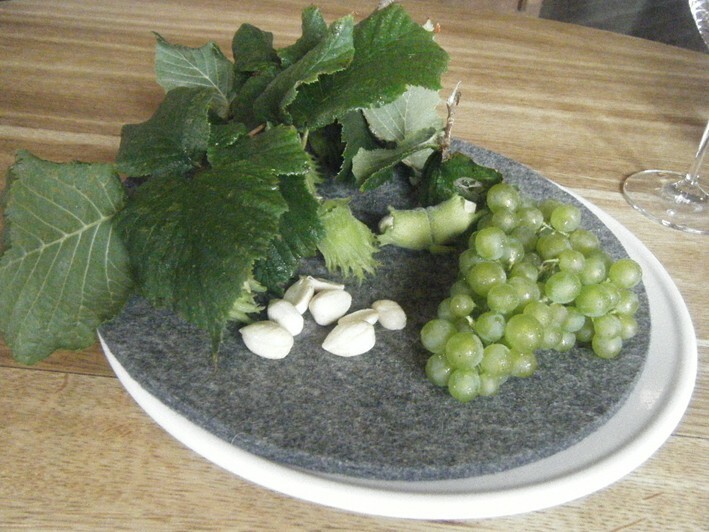 As you arrive, on the table are some excellent hazelnuts, and some rather unusual grapes, that are in fact solaris white wine grapes from a small vineyard that the restaurant owns. 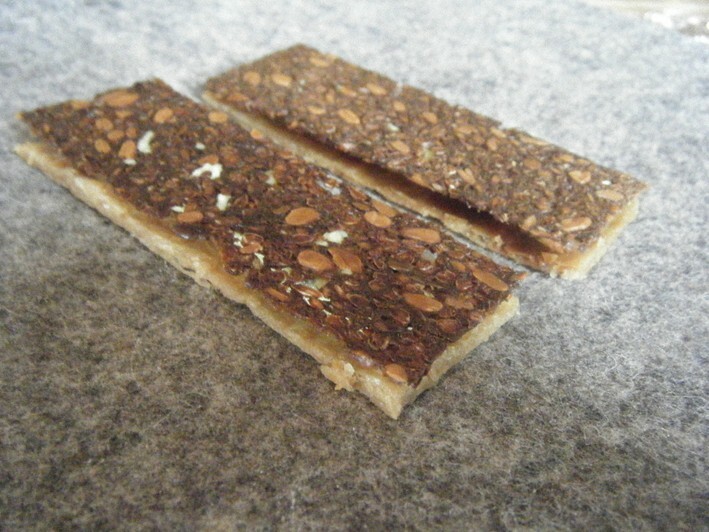 A savoury cookie with speck and blackcurrant was interesting, the fruit a natural balance to the speck. This was followed by both pickled and smoked quail egg, very pleasant though I am not sure how exciting it is possible to make a quail egg. Next was a rye bread with a layer of crispy chicken skin, fava bean and smoked cheese, the chicken skin in particular working well as a texture. 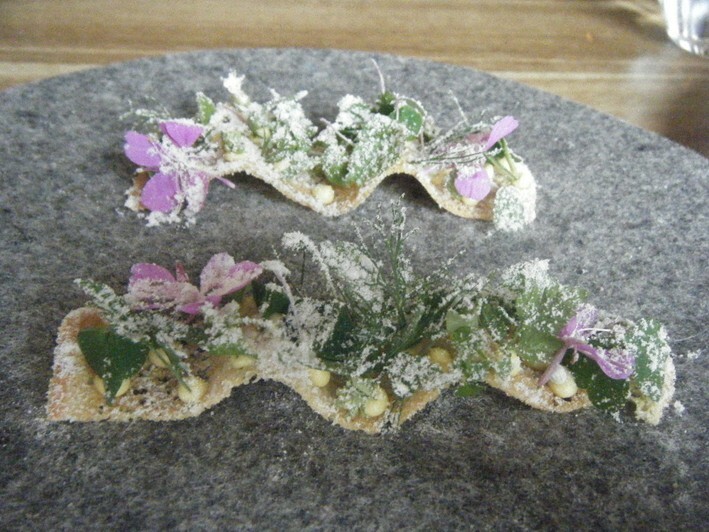 Next was a pretty dish of undulating toast showcasing wild flowers and herbs foraged locally (one was a flower that the Vikings used to eat to ward off scurvy), held together by an emulsion of brown butter and garnished with vinegar powder. 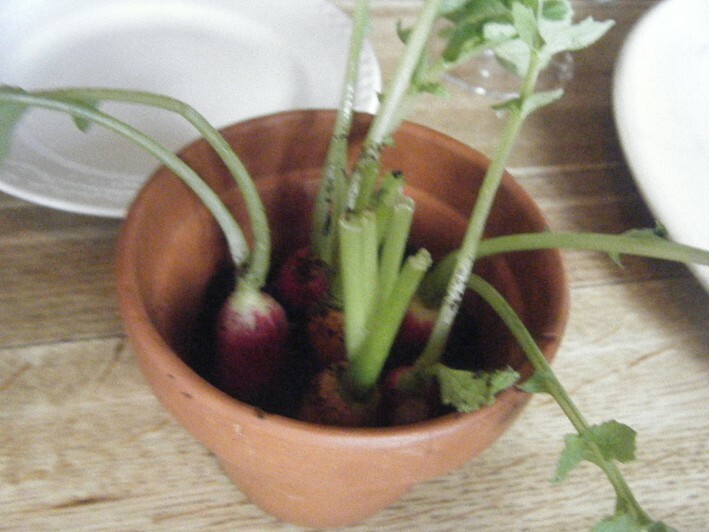 The next dish was quite amusing in presentation, with a little flower pot in which raw radishes and carrots had been planted in “soil” of hazelnuts and flour, while at the bottom of the soil was a layer of yoghurt and herbs to offset the dryness of the dish. This was clever, and the vegetables themselves had very good taste. The bread was an excellent sourdough rye, served warm, as well as a bread made from Swedish wheat. It was served with goats milk butter and pork lard with Danish apples with a crumble of pork scratchings. 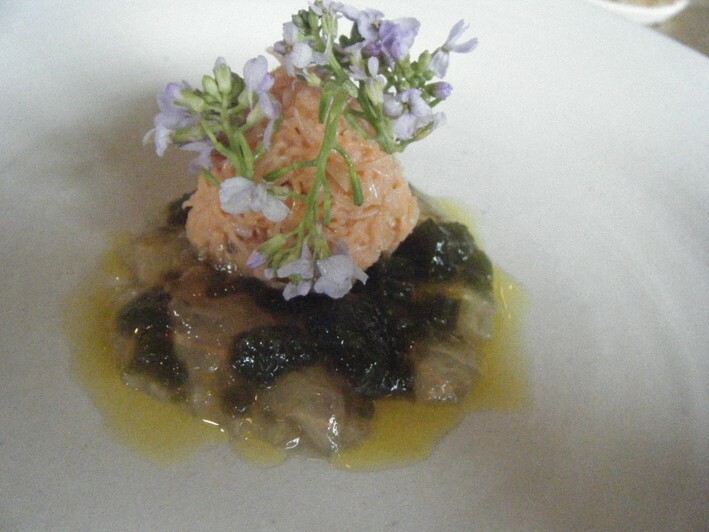 We continued with raw shrimps from Norway with pickled green seaweed, pickled rhubarb and rhubarb juice. 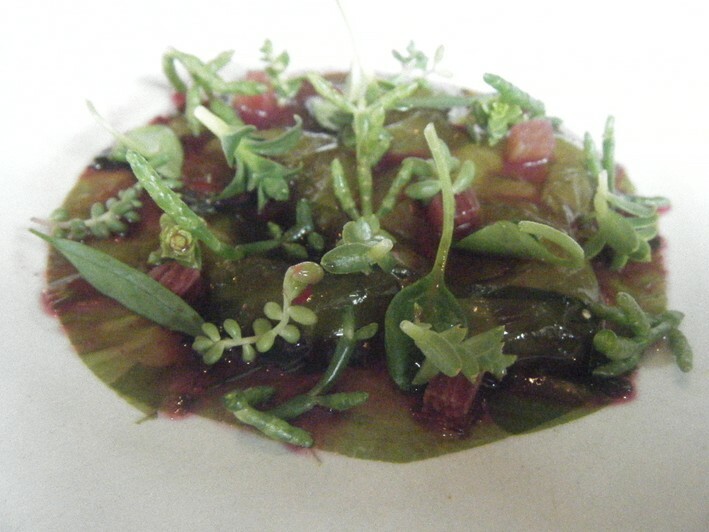 As garnish there were several beach herbs: samphire, portulac (purslane grass) and scurvy grass; I found this dish interesting but a little acidic in balance. 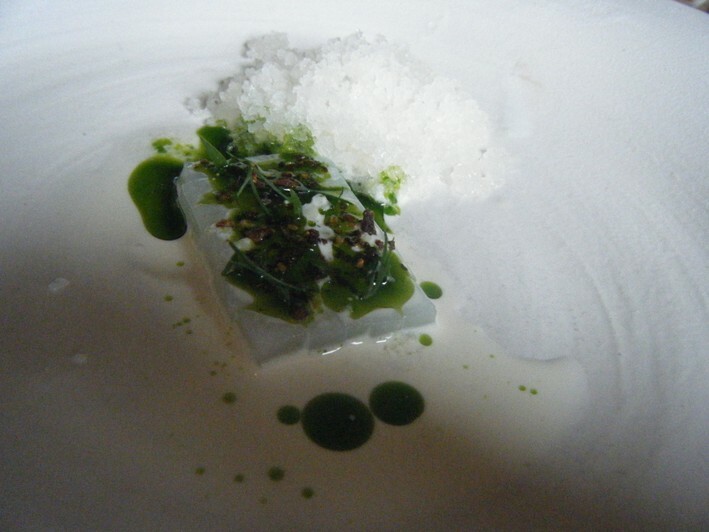 I was less fond of raw squid with white currant, cream and dill. 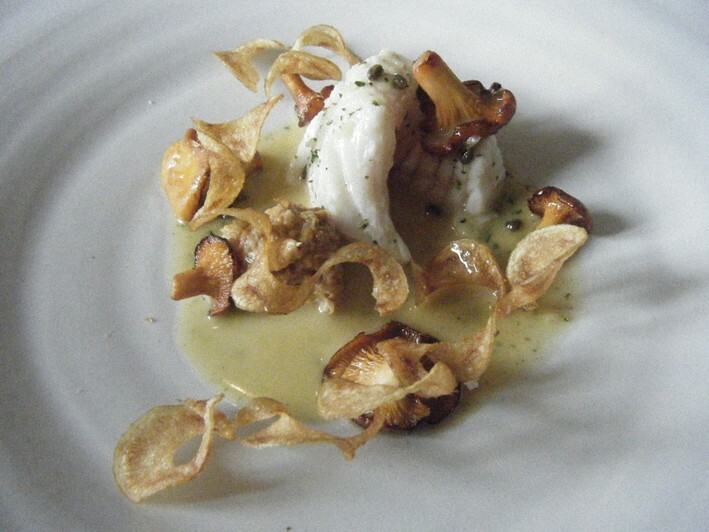 For me the dill was too dominant, and I have had much nicer squid than this e.g. in Japan, and indeed Greece. Better was brown crab and beach mustard with clams and more portulac and a dressing of rapeseed oil. The crab was excellent and the beach mustard was fascinating, a flower that tastes very distinctly of mustard, which worked nicely with the crab. 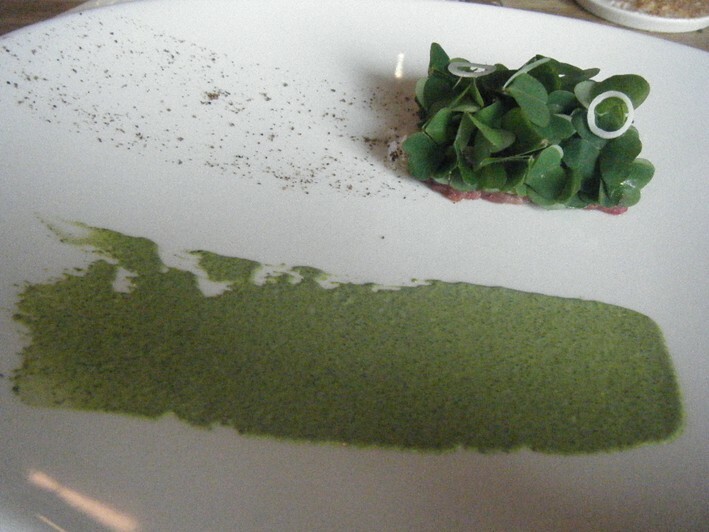 The meal continued with tartar of Danish beef, horseradish and wood sorrel with aromatic juniper powder and tarragon emulsion; for some reason you eat this with your hands. I found the beef excellent, and the pairing with the tarragon in particular successful. 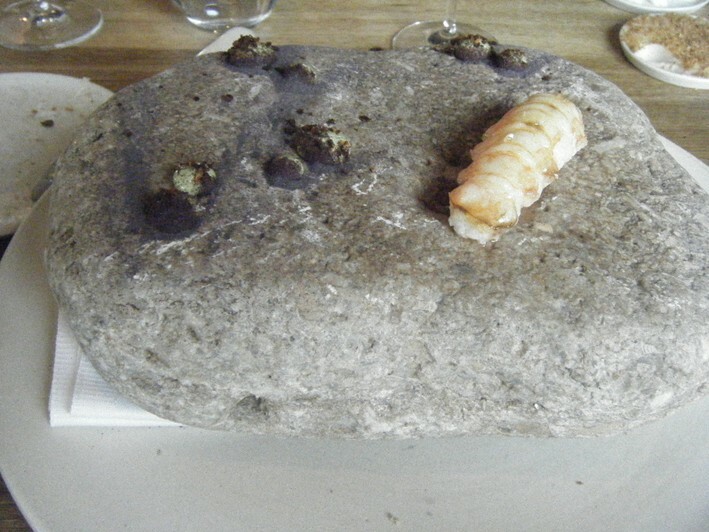 A single langoustine was next: served on a rock, with drops of oyster and parsley emulsion and seawater powder. This was deliberately barely fried, which I personally was disappointed by: I like my langoustines cooked more lightly than most, but even I would have preferred this to have been cooked a little more; for me it did not bring out the best of what was undoubtedly a fine langoustine. 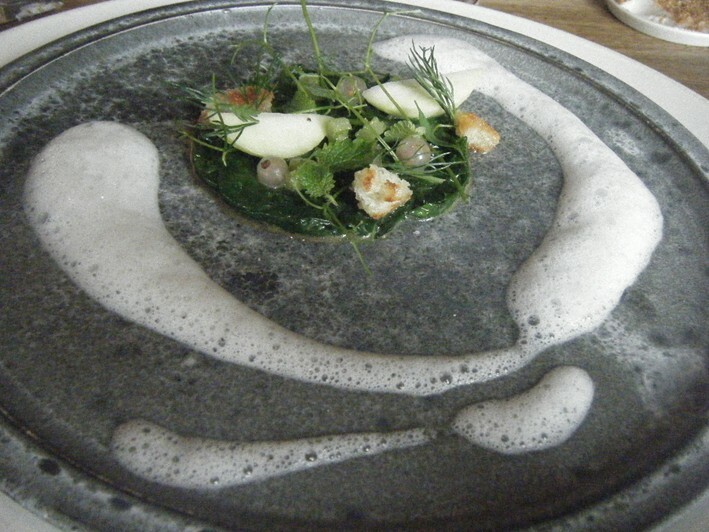 Next was spinach wilted in tea and wild herbs with cooked onions and celery, apples and white currants, with chervil dill and lemon balm and a foamy Swedish cheese sauce. The lemon balm worked well for me in this, though I wondered whether the spinach was cooked a fraction longer than ideal. 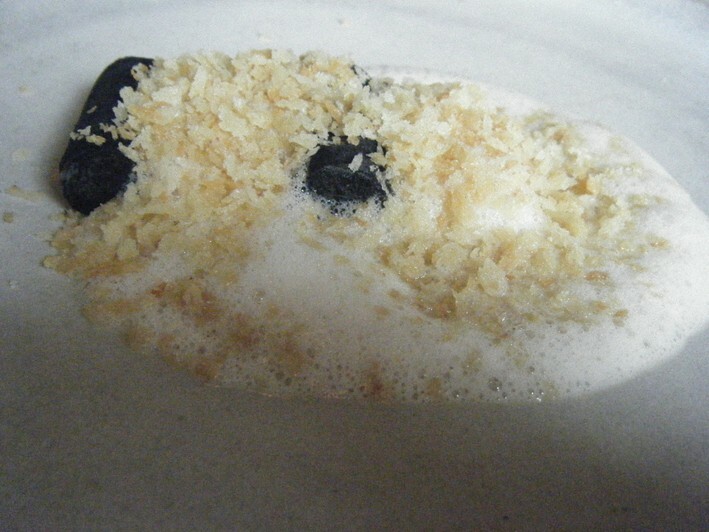 I really enjoyed the next dish, excellent king crab (poached for four minutes at 58C) with black leeks in a casing of burnt hay, and a sauce of mussels and toasted breadcrumbs. This was for me the dish of the meal, partly because the leeks had dazzling flavour, partly because I liked the texture contrasts and the balance between the crab and other elements. 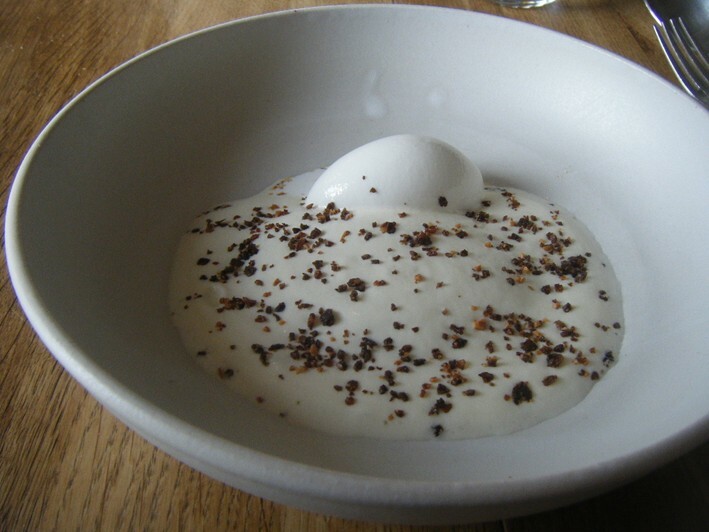 Next, onions were treated in various ways: caramelised, pickled in beer, cooked in butter, served fresh with an onion bouillon, tapioca and thyme oil, with chickweed and onion foam. This certainly brought out a range of expressions of the core ingredient, and had clean taste. This was followed by wild lobster tail that had been sautéed, served with roots of salad as well as salad leaves, with pickled rosehip flowers and a beach grass that tasted rather like coriander, further beach flowers and a sauce of redcurrant wine. The lobster itself was excellent, and the elements of this dish worked well together. Next, assorted pickled vegetables were served with a little bone marrow, herbs and a bouillon of brown butter and fat; this was a particularly pretty dish, and though pleasant I am unsure the bone marrow really added a great deal. 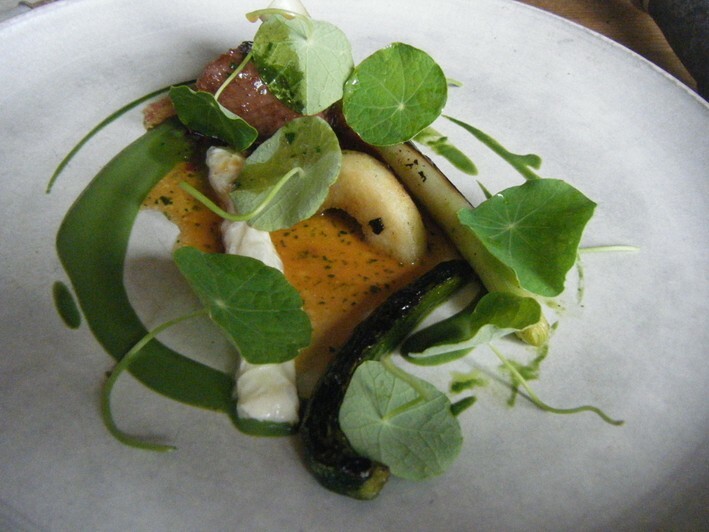 The final savoury course was musk ox (poached at 58C), served with milk skin, and slices of grilled cucumber, leek and pear, which were charred on one side (I presume deliberately, though I felt too much so) with a sauce of brown butter and chicken glaze, with a garnish of nasturtium leaves. I confess that I have never eaten musk ox before; it is reminiscent of beef, with a fairly smooth texture. Cucumber and verbena with yoghurt and meringue was a refreshing dish to follow, but my favourite dessert was the next one, walnut ice cream with frozen cream and walnut powder with dried blackberries: the walnut powder here provided a nice texture contrast to the ice cream, and the flavour of the walnuts themselves was excellent; a really top drawer dessert. 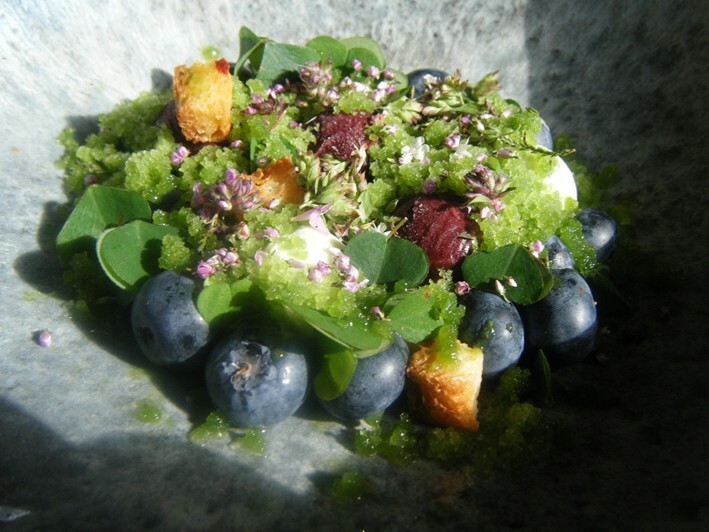 Finally there was a pretty bowl of blueberries and pine ice cream and granita, with wild thyme and sorrel leaves with thyme flowers. This was light and refreshing. I liked the way that the various chefs are encouraged to bring out the dishes to the customers, which for me engages you more with the cooking process than just being served a plate by a waiter. The service that resulted was friendly and enthusiastic, the passion of the kitchen staff clearly coming across (no less than three chefs, incidentally, were from the UK). The bill was DK 1695 (£200) per head, of which the food was DK 1295; between us we had just a few glasses of wine and some apple juice. The restaurant actually charges a supplement for credit card use (5% for Amex) on top of the bill, so you may wish to bring a large wad of banknotes (which I would have done if I had been made aware of this). While I admire the sense of purpose and vision, and the very original approach being adopted by the chef, for me there were some issues in the meal. While for example the leeks were very impressive, the emphasis on purely local ingredients hits inherent limitations: I just don’t think that the vegetables here, however carefully chosen, compare to the striking examples that can be found in sunnier Italy and France, especially from the Mediterranean. I would be surprised if many people would prefer the radish and carrot here to the dazzling vegetable croutons that appear on the table of Louis XV, for example. For me there were also dishes (noted earlier) where the cooking technique seemed almost deliberately oblique, which some may admire as bold but for me reduced the enjoyment of the dishes (e.g. the langoustine). My main issue, though, was that I did not find dishes with that elusive “wow” factor that for me characterises my favourite meals. I freely admit that I tend to err towards a preference for classical tastes and strong flavours, yet this does not explain everything here: I deeply admire the cooking of say, Joachim Wissler, Heston Blumenthal and Marc Veyrat in his day, none of whom can be accused of being rooted in the past. To be sure, Rene Redzepi is talented, but for me Michelin have it right in their current assessment: as yet this is a restaurant on a journey to the upper echelons of the world’s restaurants, rather than one that has already arrived. Join my mailing list if not already subscribed? Thank you for submitting your comment, this will be checked and added to the website very soon. I quite agree with Andy. My impression of Noma echoes his: no wow factor, and more of an experience of seeing how clever the chef could be, as opposed to seeing how good the food could taste. I came here as a Chef myself to experience Noma having heard so much , my wife and I were both confused , I understand food may not be to your taste but we both have an open mind and eat everything as we did on the night at Noma , but surely they must comprehend that overly sour dishes just are not appetizing , do they taste the dishes or is it more for creative purpose ? 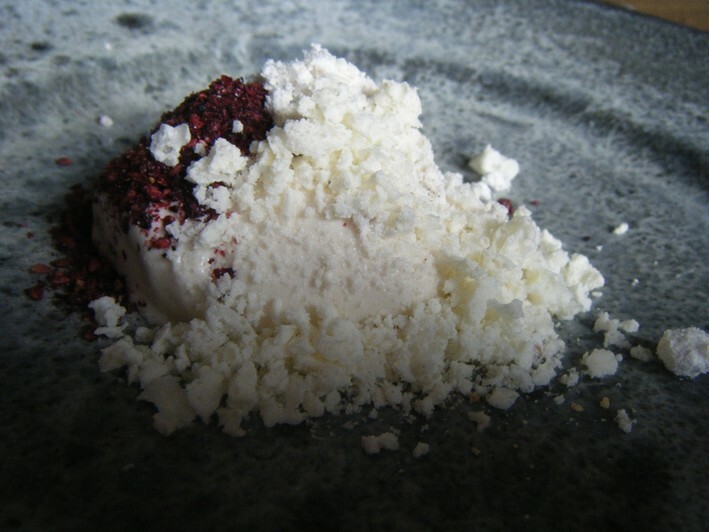 We dined at Alinea in 2010 and had a wonderfully creative meal but it also was appetizing , your body is naturally compelled to revolt with some of the dishes at Noma . I would not recommend people travel to Denmark just for Noma alone , the price leaves me most infuriated being in the industry myself I can see the margins here are in redzepi's favor big time . Do you think he is aware of this and using the "spiel " as a cover. The michelin guide really need to wake up to this "spiel cuisine" developing . We dined recently at Story in London and had more of the same , a lot of spiel behind the dishes but not that appetizing ,burnt onions etc. The chef there having trained at noma . I will be more careful with my restaurant choices in future , PR companies can make a jack russell terrier a star these days . Thanks for your website . Nigel. 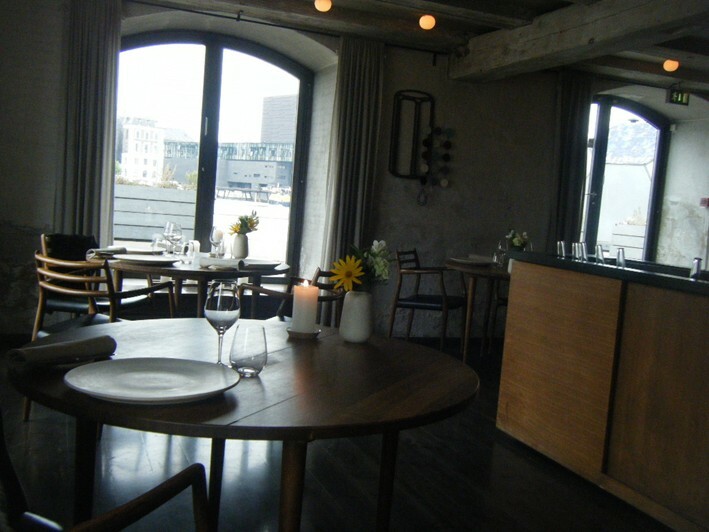 I dined at noma this past Saturday and must say it was the best restaurant experience I've had to date. I agree that it wasn't the best food I've ever had, but the excellent staff together with the mostly original ideas was superb. Me and my company was also lucky to get a guided tour through the kitchens (yes, plural) but very friendly Swedish employees and it was so unexpected and a very nice touch. Considering the Michelin Guides rating of "worth a trip" for three stars then I'd say it's a three star, but only if you consider the whole experience. Hello, I would just like to point out that I agree with Michelin's rating of 2 star, having dined here I see no individuality in his cooking other than a claim to modern Danish cuisine, his technique and dishes are a combination of Keller , Adria, and Jardin des Sens, he has substituted various Danish produce throughout but I feel strongly that he has no style of his own other than the Danish cuisine claim, which is not enough. A very good 2 star but nowhere near 3. I also forgot to mention his pot plant idea with edible soil is a dish that has been done at a restaurant in Tokyo called Creation de Narissawa since 1996. 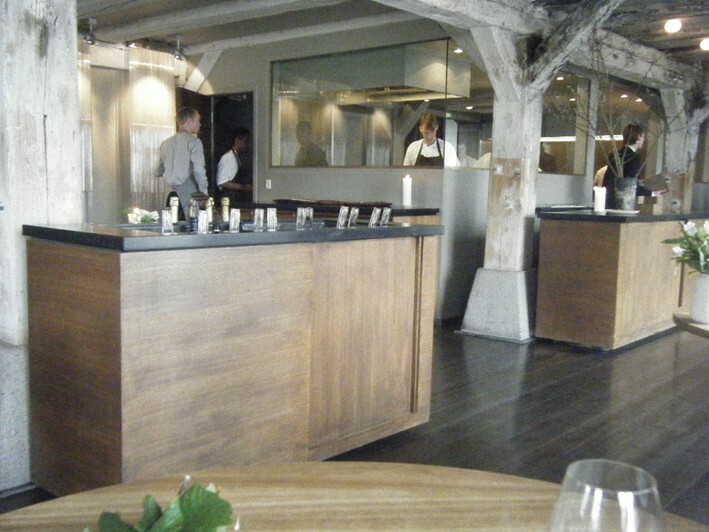 I have eaten at Noma several times and have never been disappointed because I knew exactly what to expect. I know Noma from the beginning and have a good understanding of what Rene is doing and what his objectives really are - to make the best of local ingredients. I think that Noma has it's own concept and cooking style and therefor is truly unique. 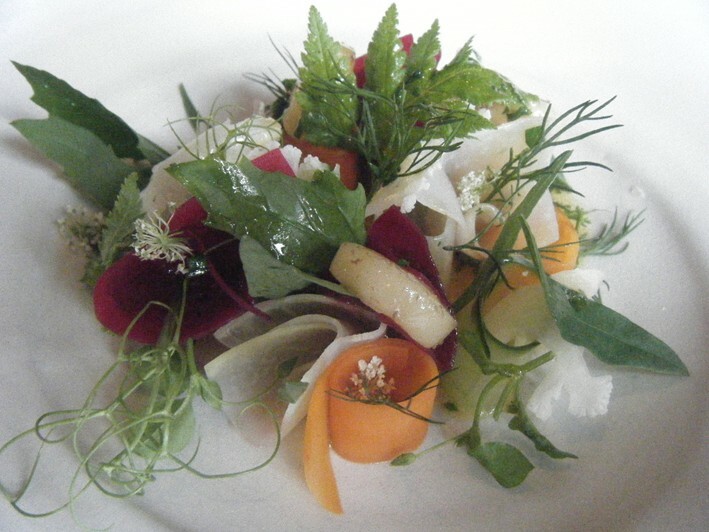 It is difficult to improve with the limitation of local ingredients. To me it is a bit like The Fat Duck - I admire the art - but my favorite place is Gordon Ramsay's - in Copenhagen it is The Paul - because there are more dishes that taste exactly like I would like them to. I had a much better meal than this at Noma. I take Andy's point that adding a few Med vegetables would liven things up, but if they did that, it would rather sully everything they stand for; relevant to note the world press is currently championing local sourcing and this place must be their figurehead. I had a truly great meal here - not the best ever by any stretch of the imagination, but certainly top ten. 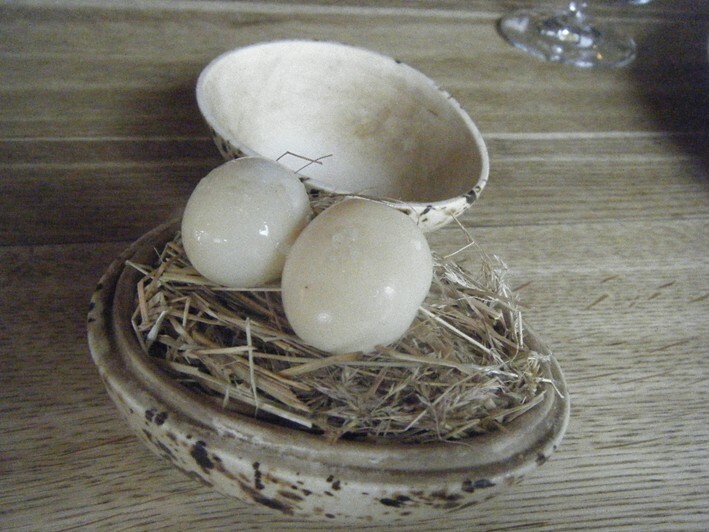 I think Noma may well be another El Bulli/Veyrat/Fat Duck - you either love it or hate it. Surprised Andy enjoyed as much as he did to be honest, certainly don't think Stella would have given it a 7! 8/9 for me. @lucymunger As long as it tastes good I am fine.